The biggest Iowa crowd so far for any presidential candidate turned out on Friday night, July 3rd, in Council Bluffs, Iowa to hear Senator Bernie Sanders speak. At least 2,600 people filled the 2,300 chairs at the Mid-America Convention Center and stood at the rear of the convention hall. The crowed cheered when he called for raising the minimum wage to $15 an hour. They applauded when he said it’s time to break up the big banks on Wall Street. They shouted approval when he credited Pope Francis for his call for bold action to prevent catastrophic climate change. They rose to their feet when he said the United States should join every other major country and provide health care as a right of citizenship. Some 79% of Americans believe that education beyond high school is not affordable for everyone. And some 57% of people under 30 believe student debt is a problem for youth. Sanders is very concerned about student debt and wants to do something practical to combat this problem. Quality education in America, from child care to higher education, must be affordable for all. Without a high-quality and affordable educational system, we will be unable to compete globally and our standard of living will continue to decline. According to a very recent Yale/Gallup poll, Some 71% of Americans believe global warming is occurring, and 57% are sure that human activity (emitting greenhouse gases like carbon dioxide) is causing it, while another 12 percent think the warming is at least partly human-caused. That’s 69% who blame human beings wholly or in part. Even among Republicans, 48% say that they are more likely to vote for a candidate who wants to fight climate change. Bernie Sanders’s is very concerned about the dangers of global warming and the need to take practical steps to combat it. Bernie wants to cut subsidies to the fossil fuel industry, but he supports them for renewable energy – so do the vast majority of American voters. 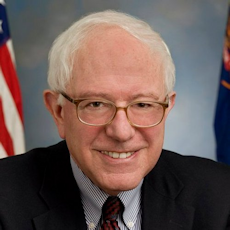 Supporting Sanders' position on income inequality, recent research from the International Monetary Fund found that when a disproportionate portion of income goes to the wealthiest in a society, it actually slows down economic growth, reducing tax revenues to fund government and increases budget deficits. On the other hand, when lower and middle class portions of the society earn more money, society as a whole benefits. The researchers calculated that when the richest 20% of society increase their income by one percentage point, the annual rate of national economic growth shrinks by nearly 0.1% within five years. This shows that "the benefits do not trickle down," the researchers wrote in their report, which analyzed over 150 countries. By contrast, when the lowest 20% of earners see their income grow by one percentage point, the rate of growth increases by nearly 0.4% over the same period. Speaking plainly about the issues Americans care most about is gaining traction with voters. On Wednesday, two days before his record turnout Council Bluffs campaign stop, Sanders made headlines by drawing an overflow crowd of 13,000 supporters to a campaign event in Madison, Wisconsin – the largest crowd assembled by any candidate so far this year. Then, on Thursday, his campaign announced that it had raised $15 million in the two months since April 30. A Quinnipiac poll released last week showed Sanders gaining ground among voters in the early primary state of Iowa. Over the July 4th weekend, Sanders made a number of campaign stops all around Iowa, joining parades and speaking holiday events. Also, last week, Larry Cohen, outgoing president of the Communications Workers of America (CWA), one of the nation's most powerful labor unions, said he has joined the Sanders campaign as an unpaid volunteer. Between June 25 and July 1, the most popular hashtag associated with the Vermont senator’s presidential campaign, “#feelthebern,” was tweeted an average of 6,800 times-a-day, while “#hillary2016” garnered 2,700 tweets, according to Topsy, which tracks activity on social media. Winnie Wong and Charles Lenchner, veteran political organizers, created the #feelthebern hashtag and co-founded People for Bernie Sanders, a digital platform where the senator’s supporters can network and organize outreach efforts both online and off. Through those efforts, People For Bernie has so far enlisted 10,000 campaign volunteers, according to its organizers. Wong believes that social media will play a greater role in 2016 than it has in any prior election. Why is Bernie Sanders Catching Fire with Voters, and Hillary’s Lead Shrinking?